First Ever Paddle Across The Gulf Stream! 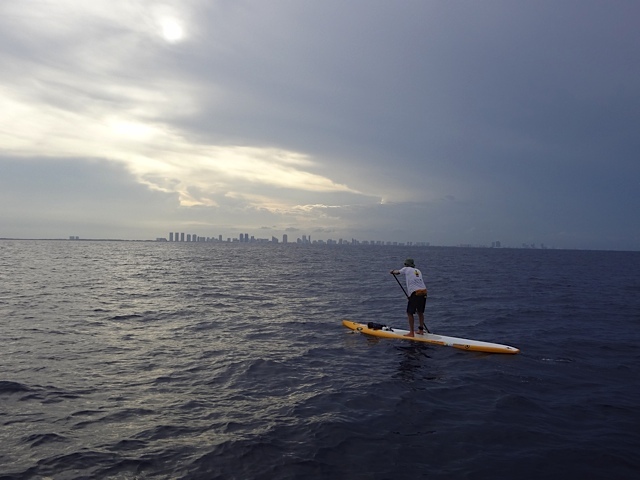 Last week two surfers and activists from the Surfrider Foundation Miami Chapter completed the first ever paddle across the Gulf Stream as they completed a 60 mile journey from Bimini in the Bahamas to Miami, Florida! Bill Whiddon and Thaddeus Foote made history on Saturday, June 9th, becoming the first to cross the Gulf Steam on stand-up paddleboards. The pair, paddling to raise awareness for Surfrider’s Rise Above Plastics campaign, battled rainsqualls, searing summer heat and the natural northern drift of the Gulf Stream, to complete the 60-plus mile epic journey in 17 hours, 11 minutes and 43 seconds. The cause behind the “Bimini to Miami Blue Water Challenge” is to raise awareness for Surfrider’s Rise Above Plastics campaign to reduce plastics in the ocean. Specifically in Florida, Surfrider is pushing for state legislature to adopt the Department of Environmental Protection’s Recycling Recommendation Report and new statewide recycling goal of 75% to be achieved by 2020. "We’re living in a throwaway culture fueled by our misguided dependence on single-use plastics,” said Holly Parker, Surfrider Foundation Florida Regional Coordinator. “If we don't make a conscious choice to stop this destructive practice then we threaten the health of our oceans, ourselves, and our children." Thaddeus with the Miami Skyline in Sight!